Note the exact time at which the pain started and what the patient was doing at that time. Sudden, severe pain awakening a patient from sleep may be associated with acute perforation, inflammation, or torsion of an abdominal organ. A stone in the biliary or renal tract also causes intense pain. Note acuteness of the pain. Acute rupture of a fallopian tube by an ectopic pregnancy, perforation of a gastric ulcer, peritonitis, and acute pancreatitis cause such severe pain that fainting may result. It is crucial to determine the location of the pain at its onset, its localization, its character, and its radiation. Commonly, when an abdominal organ ruptures, pain is felt ''all over the belly,'' without localization to a specific area. Pain arising from the small intestine is commonly felt in the umbilical or epigastric regions;for example, pain from acute appendicitis begins at the umbilicus. After time, pain may become localized to other areas. Pain from acute appendicitis travels from the umbilicus to the right lower quadrant in about 1 to 3 hours after the initial event. Pain in the chest followed by abdominal pain should raise the suspicion of a dissecting aortic aneurysm. Figure 17-3 Common areas of referred pain. The dotted area is on the posterior chest. the abdominal or chest wall, shoulder, jaw, or other areas supplied by the somatic nerves. Pain appears to originate in areas supplied by the somatic nerves entering the spinal cord at the same segment as the sensory nerves from the organ responsible for the pain. For example, right-shoulder pain may result from acute cholecystitis;testicular pain may result from renal colic or from appendicitis. 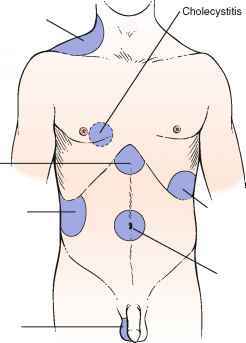 The common sites for referred pain are shown in Figure 17-3. The locations of pain in abdominal disease are summarized in Table 17-2. 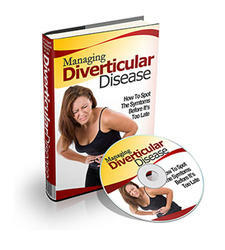 Appendicitis Diverticulitis have pain 2 to 3 hours after eating or before the next meal. Food tends to lessen the pain, especially in duodenal ulcers. Perforation of a duodenal ulcer to the pancreas may produce backache, simulating an orthopedic problem. Nocturnal pain is a classic symptom of duodenal peptic ulcer disease. Pain after eating may also be associated with vascular disease of the abdominal viscera. Patients with this condition are older and have postprandial pain, anorexia, and weight loss. This triad is seen in abdominal angina resulting from obstructive vascular disease in the celiac axis or the superior mesenteric artery. Table 17-3 summarizes the important maneuvers for ameliorating abdominal pain. Why pancreatitis pain decrease on leaning forward? Why there is relieve in pain in bending forward in pancreatitis? Why pancrestic pain relieved on stooping forwsrd? Why bending forward relief pancreatic pain? Can peritonitis pain be releived by leaning forward? What disease condition that leaning forward relieve abdominal pain? Why pain is relieved by bending forward in pancreatitis? Why pancreatic pain relif after leaning foreward?